If you compare today’s workspaces to offices even five and ten years ago, the difference is incredible! The way we work today is practically unrecognizable from years gone by. Our workspaces are now designed to align with both the staff using them and the work they do, not to mention the everchanging technologies we use (and how dependent work life is on them). And, as the way we work changes, so too, do our workplaces. Offices are designed to inspire and transform, they’re designed to create culture with an ambiance that attracts, nurtures, and retains talented professionals and an atmosphere rife with possibility. With that in mind, here are the design trends we’re excited to explore in 2018. Okay, the argument might be nature versus nurture (and yeah, it’s not about outside nature, but just go with it!). Since we spend 90% of our time indoors, biophilic design allows us harness nature by bringing it indoors to nurture and uplift our teams. Modern office design focuses on how workspaces make people feel and by greening up the office, you have a tangible, proven way of lifting tension, decreasing stress, increasing productivity, igniting creativity, and raising overall wellbeing. Biophilic design creates endless opportunities for creativity from living walls to rooftop gardens, from terrariums to indoor gardens. Don’t forget other natural elements though, it’s not just about the greenery. Biophilic design is about nature, so that expands the creative palette to include woods, stone, sands, and fibres as well as water, air, and light in interior design and décor: think honeycomb, concrete, brick, and driftwood; picture large and plentiful windows that open; imagine tired stone fountains and salt water aquariums. And while 2017 really made utilizing biophilic design elements popular, combine it with LEED® and GreenGlobes building becoming best practices, we’re sure to see it continue through 2018. While this trend is yet to coin itself a name, it stems from the continual blurring of lines between work and home. In the past, employees would do their best to make their cubicles or tiny offices feel home-like with plants, pictures, artwork, and lamps, but now, businesses are seeking to fill this innate need for a sense of belonging by imbedding it in the interior design. 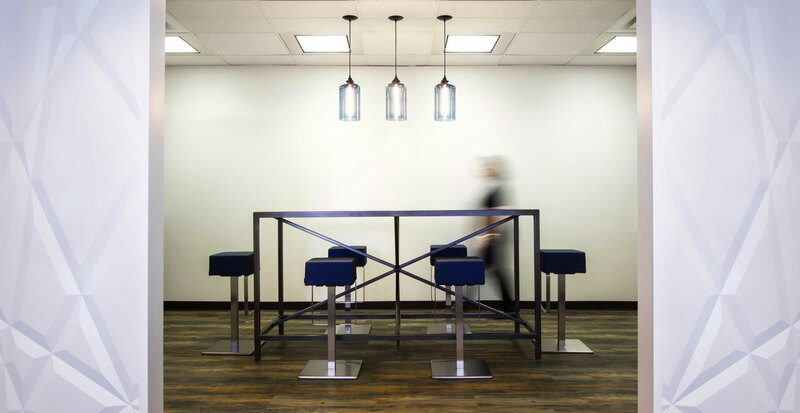 It’s not uncommon now to walk into a commercial space and feel like you’re entering a beautifully designed home complete with funky furniture, soft lighting, cozy spaces, and greenery. This trend is largely an indication that businesses are listening to the growing millennial workforce by creating holistic workplaces that are inviting and comfortable. Think creature comforts: artisanal coffee and espresso machines, relaxing breakrooms with video games or pool tables, meditation rooms, natural light and lamps, a fully functional staff kitchen, and an appealing aesthetic. In addition to create a positive, familiar workspace, this trend also emphasizes collaboration over traditional office hierarchies. 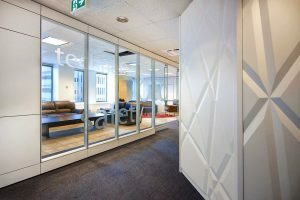 An effective and playful way to create the home-like atmosphere of the modern office is with texture. And since so much of modern design is minimalist and streamlined, designers are adding textiles and textured elements to evoke a home-like nostalgia. From faux fur throws to quilted pillows, from imprinted concrete features to bamboo wall dividers, and from fabric wall panels to handwoven rugs, designers can choose personalized elements that are both appealing and engaging. Not only do textured elements make a space feel like home, but it also adds depth and intrigue in addition to having limitless possibilities for originality and personalization. Not necessarily a new trend, flexible layouts ultimately have staying power. Because the way we work, what we do, and who we’re doing it with changes continually, workplaces are starting to reflect that need in their office design. By designing spaces that can quickly and easily transform for various functions from office parties to conferences, businesses promote creative, out of the box thinking and encourage innovation and adaptability. Think moveable furniture, moveable walls and wall dividers, garage doors, and moveable whiteboards. But more than that, offering flexible spaces to work in: no assigned desks, open plans, quiet rooms, collaborative rooms, and third spaces. That’s right, designing offices for technology (which can be a challenge given how quickly technology changes) is almost as important as your office’s layout. From incorporating technology in design by making cords invisible and unencumbered and power points and docking stations accessible and intuitive to automation and sensor technology for heating, cooling, and lighting, technology is embedded in our work lives and design is rising to meet the challenge (and the demand). If any of these design trends speak to you, but you don’t know where to start, reach out to us. We’d love to give you a complimentary design consultation and talk about your dreams for your company’s future.